Written by Sean Flannigan on August 2, 2018 Blog, Customer stories. Genetic testing has blown up in recent years. We of the hominid persuasion use it mainly to determine where in the world our ancestors came from. DNA testing has also become big business for the furry little carnivorous companions we keep around our homes. While breed testing is increasingly popular, disease testing is the key driver of the boom. Dog DNA testing is super important for breeders and veterinarians to understand and prevent painful hereditary diseases. Early on, there were just a few labs offering expensive disease tests to breeders and vets. As genomic technology progressed, so did the business of genetic testing. With better technology in place, more companies could join the fray. Before 2008, Dr. Micah D. Halpern was working in forensic science, pathogen detection, and animal genetics. On top of that, he co-authored a number of peer-reviewed journal articles and published a handful of genome sequences. This wealth of experience plus his love of animals pushed him to try something different — working for himself. He recognized that the major barrier to reducing genetic diseases in dogs was the excessive cost of testing. He wanted to change that. The catalyst? His own pet. Micah and his wife, Adriana, found that their Australian Cattle Dog had a genetic eye disorder that would eventually leave him blind. 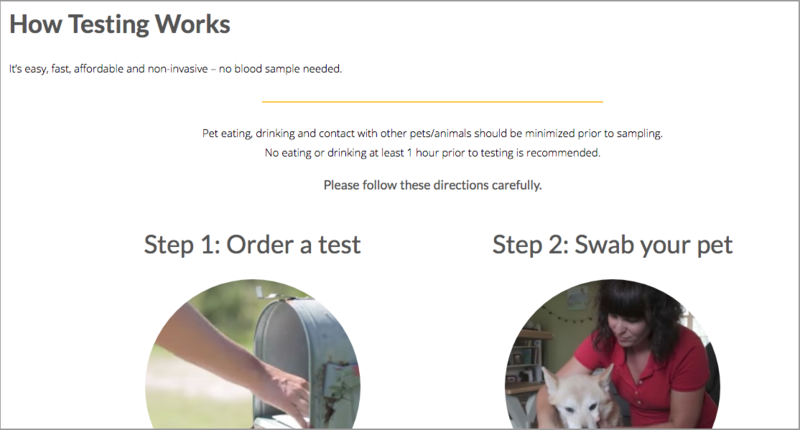 Knowing that breeders would be better able to reduce the prevalence of genetic disorders in dogs if testing were more affordable and available, the Halperns started GenSol Diagnostics. As their customer base grew, so did their business and staff. They’ve been lucky to find employees that are as dedicated to improving dog health as they are. Since they started GenSol, they’ve seen a sharp decrease in the cost of disease testing and a greater overall availability in the market. They are happy to have the most affordable tests in the business while focusing solely on disease and coat/color testing. GenSol didn’t originally start on the WooCommerce platform, but their original eCommerce platform wasn’t satisfying their needs and didn’t work intuitively for their business. WooCommerce came highly recommended, so they made the switch and never looked back. WooCommerce helped them position their online store for success. Asked to distill their experience using WooCommerce in three words, Micah said, “effective, efficient, and flexible.” We at coolblueweb could not agree more. The right eCommerce platform wasn’t enough, though. Their competitors were building up their websites with the newest web development improvements, and the Halperns realized that their site needed an overhaul. After interviewing several development agencies, they landed on coolblueweb. Since they were already on — and happy with — the WooCommerce platform, they liked the Woo experience we brought to the table. WooCommerce Role-Based Payment and Shipping Methods – This extension gives GenSol total control of the shipping methods and payment gateways available to different types of users, from administrators and editors to subscribers and customers. WooCommerce Sequential Order Numbers Pro – With this extension, GenSol’s order numbers increment instead of randomizing, making for a more organized system. WooCommerce Print Invoices/Packing Lists – This extension simplifies the process of printing invoices and packing lists for outgoing orders. GenSol can print directly from the order list page, and has the ability to customize the information on the resulting documents. 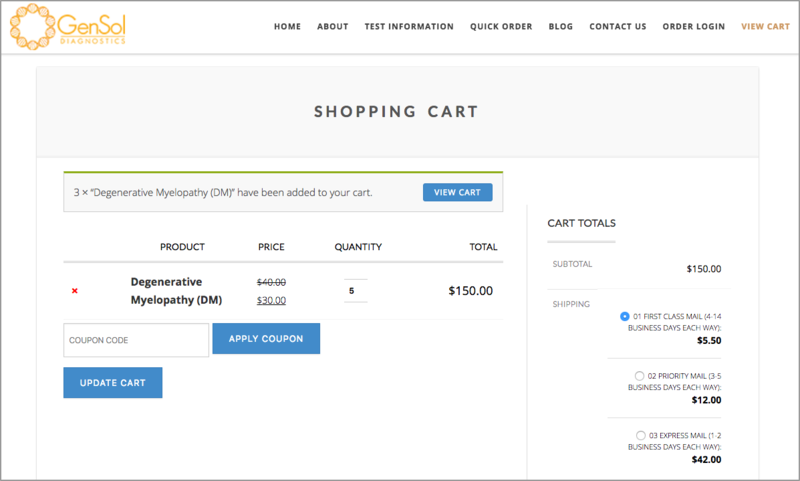 WooCommerce Conditional Shipping and Payments – This extension gives even greater control over the payment gateway and shipping methods by allowing limits based on product type, product weight/dimensions, customer location, and order total. If you’re interested in the full detail and specifics of the store build, take a look at GenSol’s Showcase entry. As their testing capabilities improve and grow, GenSol wants to reach more customers. Staying up to date with the latest web technology and maintaining a great experience for their customers is very important. 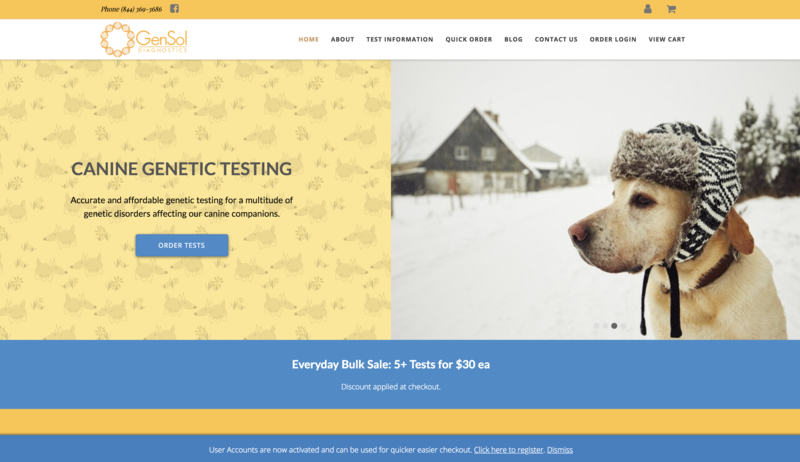 Leveraging their relationship with the WooCommerce platform and the expertise of the coolblueweb WooExperts, GenSol will continue to grow and thrive in the realm of canine genetics. Hey, I think My dog also need this. Please help me I don’t know what happen to him suddenly he starts crawling and close his eye. Please help. Hey, dude I think you should change diet for 2 or 3 days. Otherwise you should consult with doctors. Very amazing posting. Recently I have come across a lot of stuff because my dog is just behavior weird. It seems like I should try these things too. GenSol is great design. Sorry wrong topic but I really like GenSol design and format.